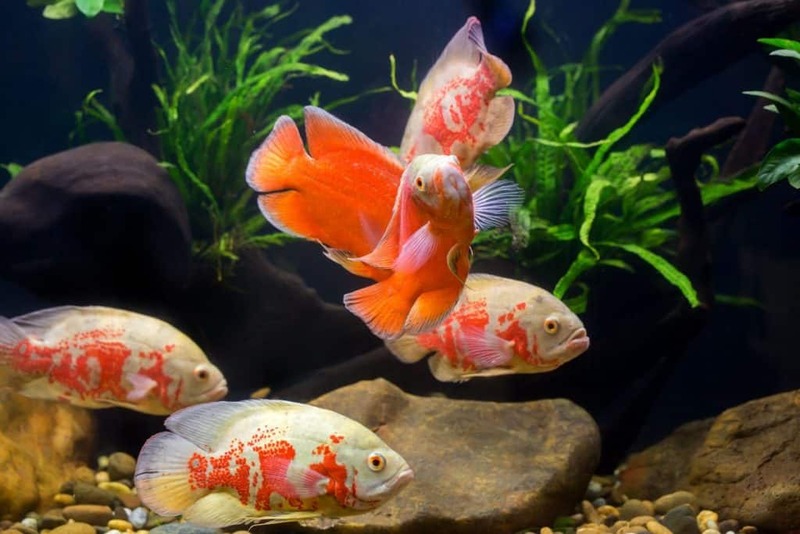 When it comes to caring for the attractive and intelligent Oscar fish, tank size has to be one of the most important considerations. This is mainly due to the Oscar fish’s rather large size, and the space that they need to swim. To give you an idea on a Tiger Oscar’s size they can grow up to a massive fifteen inches, though 12 is far more common. They do this in a relatively short period, growing approximately an inch per month. By the time they reach their maximum size they can weigh in at an incredible 3 pounds! What Size Tank Do I Need For An Oscar Fish? When it comes to picking a tank for your Oscar fish, size, or water capacity, is not the only important thing. It is also of great import that you pick one with the right dimensions, i.e. the right shape, to give them ample room to turn and swim. Though it is true that Oscars are not the biggest swimmers, they still do it and need room to do so. The dimensions of a suitable tank for Tiger Oscars will vary dependent on the water capacity. However, what all Oscar fish tanks should have in common is that they are wider than they are high. Basically, they should be rectangular with a depth of at least 24 inches. What size tank do oscar fish need? The water capacity required will also vary depending on the number of Oscars you plan on keeping. Based on the recommended numbers which are either a pair or a small group, you will need a tank of at least 100 gallons for two. Group size will, of course, vary depending on how many Oscars are in the group but based on five, tank size should be 300 gallons plus. Any Words Of Wisdom Based On Tank Size For an Oscar Fish? It may be tempting due to the initial layout for an Oscar fish tank and all the equipment you will need to buy a smaller one than required. After all, Tiger Oscars are often little more than 1 ½ inch when they are purchased, so certainly don’t need 100 gallons at this point. They do, however, as mentioned previously, grow very quickly, approximately an inch per month, so this could be a false and short-lived economy. Juvenile Oscars Don’t need a large aquarium. However, they will grow fast! Another aspect to consider is that the recommended Oscar tank sizes above do not take into account any tank mates that you may want to add. These will need to be researched to see what tank size they may require. You can then use an aquarium calculator, it’s the easiest way, to see if your tank can accommodate them. Finally, it makes absolutely no sense, unless you really want to, to give Oscar fish decorations. Oscars are renowned for rearranging their tanks, turning them upside down, and for digging up their substrate. Live plants are also a huge waste as the Oscar will uproot them time and time again. So What Do I Need For An Oscar Fish Tank? There are three really important pieces of equipment for any Oscar fish tank, the first being a powerful filtration unit. Due to the size of an Oscar tank and their tendency to be a messy fish, external filtration is undoubtedly the best choice. Where possible you should also go for a bigger capacity filtration unit than your tank needs. For example, a 70 GPH (gallon per hour) tank would usually be sufficient for a 70-gallon tank. For Oscars, however, a 100 GPH filtration unit would be more suited. The second important piece of equipment for an Oscar Tank would have to be the heater. 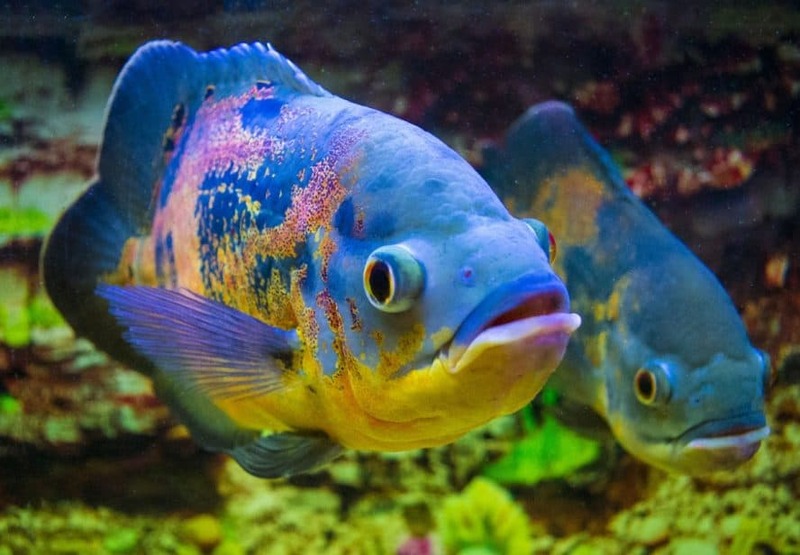 Oscars are a tropical fish that require temperatures of 74-81℉ or 23.5-27℃. You will also need to monitor the temperature within the tank as Oscars do not always react well to change. Be warned, however, that an internal thermometer may get destroyed by your Oscar who will not welcome it as a visitor. The final must-have piece of equipment for an Oscar tank is a secure fitting lid. Tiger Oscars are incredibly adept jumpers and can lift a loose-fitting lid several inches when fully grown. This skill is one that Oscars use readily in their natural habitats to catch insects on leaves and branches that hang overhead. For more information on suitable tank mates to live with a Tiger Oscars, then read our latest article here: Tiger Oscar Tank Mates. Of course, there are other things that you may wish to add to your Oscars tank. For example, you may wish to give them some fine substrate as Oscars love to dig. An odd ornament also may be a welcome addition as Oscars have been known to play with them. 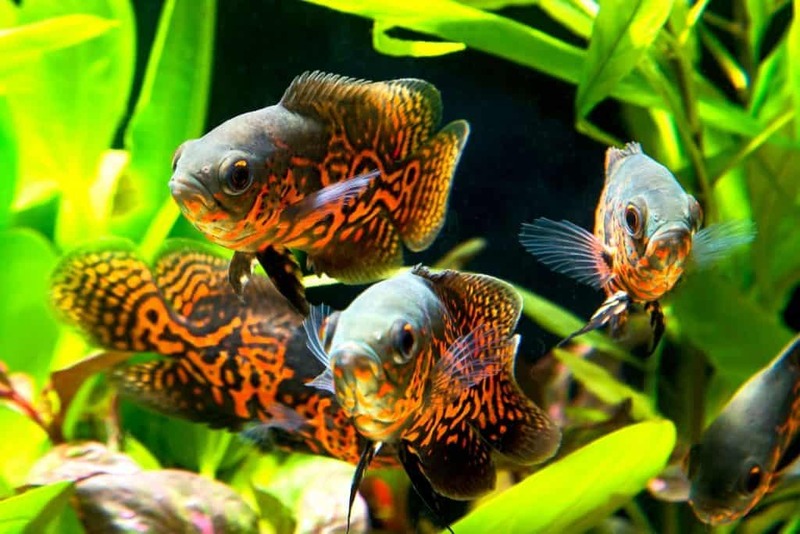 For a complete guide to Tiger Oscar Fish you can check out our Species Profile. However, these aren’t the most important thing, rather, tank size is. After all, without a tank of appropriate size an Oscar fish may suffer, and that’s the last thing any fish keeper wants.